WorldTravelService® is proud to partner with Virtuoso, which gives our clients in the DC area and throughout the Mid-Atlantic access to exclusive deals, amenities, and upgrades. Our partnership with Virtuoso also gives us access to their entire network, including Oceania Cruises, so you can have even more choices when it comes to booking your next luxury cruise. The Oceania cruise experience is one-of-a-kind—see the benefits below or contact us to book an unforgettable vacation. 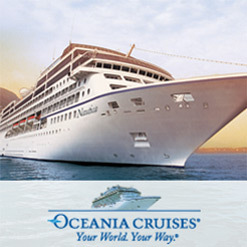 Let Us Help You Book Your Oceania Cruise! Experience the endless benefits that come with booking your Oceania cruise through WorldTravelService® and enjoy the vacation of a lifetime—plus the extra perks for future cruises! Call us at 800-676-3796 for questions or to book your trip today.